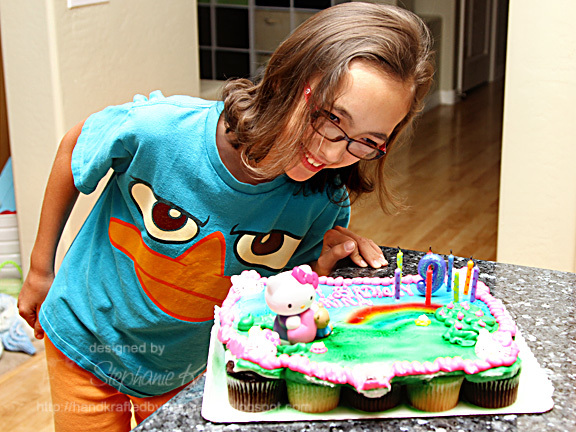 HandKrafted by Stephanie: Happy Birthday, Sabrina! Hello! It's time for a brand new Mojo Monday sketch (#241). It's also my baby girl's 9th (EEEK! One more year before she's a tween!) birthday! Happy, Happy Birthday, Sabrina Grace! Teresa has a fun sketch for us (I flipped it). I used Love Deepens to stamp my sentiment, "World's Best Daughter". I also added several of her favorites (pink, butterflies, flowers and bling)! Accessories: A Cut Above Dies: Ribbon Banner Die (Verve), Standard Circle and Scalloped Circle Nestabilities (Spellbinders), Rhinestone flourish, Roses (Wild Orchid Crafts), Foam tape, Thread, Sewing machine. Such a beautiful card Stephanie! Hope you had an amazing Mother's Day! 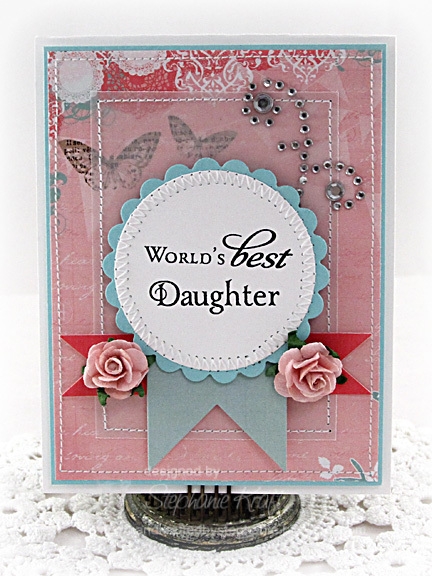 wow, this is a gorgeous card for your daughter...she is super cute! Happy, Happy Birthday to her and lots of hugs. Have a wonderful week Steph! Stephanie, this is soooooooo pretty! Love that you added that velum as a layer!!! Must remember to pull out my vellum soon! What a beautiful card! The vellum layer is beautiful. Very beautiful card for your daughter! Happy birthday to her! I also love vellum! what a darling card for your daughter! What a gorgeous party it was! I had really amazing time reading through this post. My girl was also very happy in her recent birthday bash. I threw a surprise vintage themed party at the local event venue Atlanta on her 12th birthday. She loved her polka dot black and white dress which her grandmother gifted her.